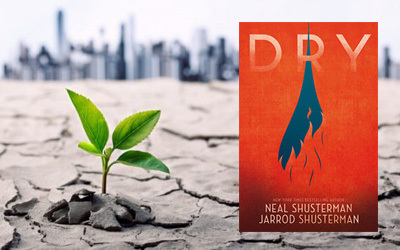 I wanted to say that (Neal) Shusterman is the king of – incredibly realistic – dystopian stories, but then I realised there are two of them now, so I’ll just let them reign over the fandom the way they like. After all, I’m only here to rave about this story, another gem I was delighted to read. 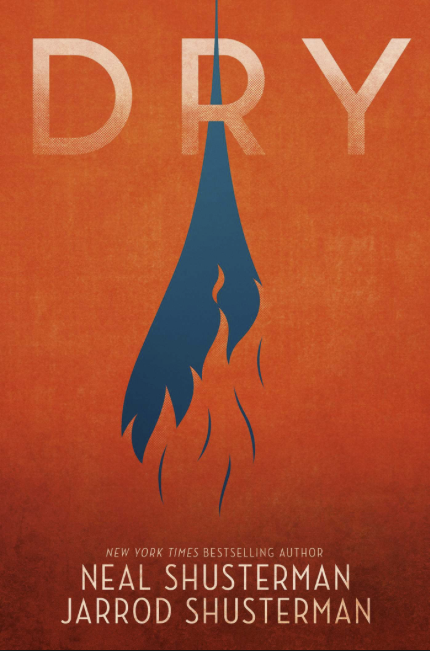 Dry is what Unwind was quite some years back – a glimpse into the metaphorical mirror of humanity. And one might never like what shows up there, on that shiny surface that reflects back (towards the reader) all the horrors and the darkness people hide behind “civilisation” and manners and law, but that’s what makes his (in this case, their) stories even better. Because people are not born monsters, they become… And it hurt, again it hurt deeply to read a book so raw and real and powerful. The story starts at the very beginning of the tap-out and it follows the characters through the nightmare that is to come. There are four characters (Alyssa, Kelton, Jacqui, Henry) narrating the story consistently, but we get reports or points of view from other side characters through the book, adding authenticity and realism to the story. Slowly we get to meet them (including Garrett, Alyssa’s brother) and figure the dynamics between them, right before they are thrown in what’s to be the adventure of their lives or right in the middle of it all. I liked how distinct the characters were (I’m not speaking about the racial aspect – I vaguely remember most of them having different European ancestors, though historically speaking there’s no surprise there – but in terms of how their were built by the authors and made to think and interact), how distinctive their voices were, how different their approach to facing the drought was. Don’t be mistaken, this is not an actual group of friends – Alyssa didn’t liked much Kelton, as she found him a bit creepy, though Kelton was a bit infatuated with the girl next door, while Garrett was the little brother eager for everything adventurous (until the adventure got the best of him); Jacqui was angry at the world for unknown reasons and Henry was – simply put – an opportunist. When the world as they know it crashes and burns all around them (partly figuratively, partly literally speaking), they have to figure things out and make unusual alliances in order to save their lives. Their journey is sometimes far-stretched (I did not mind it, it’s fiction after all), but it’s rich in suspense and it offers the opportunity to see people without masks, people acting instinctively, people desperate to their core, people making terrible mistakes, people turning against each other, people killing or letting others be killed. The progression is slow, you have time to get a taste of the life before, you get to feel the tide turn slowly – second by second, page by page and still when the moment comes you can feel the power of destruction deep in your bones. As a side note, knowing also a tiny bit about the situation in Cape Town, South Africa, where what for us is (yet) pure fiction, for them is the reality (the had faced their own water crisis), my first thought while reading this story was “oh boy, this has escalated quickly”, the second being “this could actually happen at any given moment in a lot of places!”. It made me think… A lot! Anyways, a very important part is how the main characters changed through this story. Sometimes for the better, sometimes for the worse, I am not judging here, all the things they did were in order to survive. But it was hard to witness it, it was hard to see how the world failed them, how they were meant to make such tough decisions. (view spoiler) Also, I won’t get too much in detail here, but I did wish for a particular character to feel a bit more remorseful at the end. Otherwise it just felt a bit out of character even considering all that growth. All in one, DRY was an incredible experience and I loved each moment of it. It’s disturbing, raw, hard to take in, but still it’s a great story about what humans become when their hearts and conscience run as dry as their swimming pools. I highly recommend this book, probably as much as I recommend the Unwind Dystology. Unwind is my favorite series of all time, so I’m so excited that this book lives up to it! It starts slower than Unwind, but the world created is very realistic and the characters step on that grey edge where you can’t help but rooting for them no matter how the world transforms them and how hard their choices can be. And I always love a story about the human nature and (why not about) survival. I hope you’ll love it just as much!